Sony VPL-VZ1000ES hands-on hands on review | What Hi-Fi? At first sight, Sony’s newest projector is easily mistaken for a small table or an ornamental decoration. We first met the VPL-VZ1000ES at CES 2017, but now it’s made it over the ocean to the UK. Successor to the short-throw LSPX-W1S projector, the VPL-VZ1000ES is 40% smaller than the device it replaces - it’s nearly a metre long, and about as wide as a MacBook Pro. It’s not light though, weighting in at 35kg. On its top is the opening for the 2500 lumens lens - Sony doesn't have any information to hand about its size, but it is a more curved, smaller model than that fitted in the LSPX-W1S. That lens will will give you an 100-inch, 4K HDR image (or 2K for 3D movies) at a distance of just six inches from the projection screen. Connection is through one of its four HDMI 2.2 ports or a USB Type A input. It’s pretty future-proof, as it supports the HLG (Hybrid Log Gamma) standard for broadcast television. If you want to use it for gaming, it’ll keep up with 60fps content as well. If you’re watching anything less than 4K, the VPL-VZ1000ES has Sony’s “Reality Creation” software built in - a fancy name for its upscaling process. Alongside that are the expected settings for adjusting your image, as well as the “Cinema Black Pro” mode (a secondary contrast adjustment) and ‘Motionflow’ for motion smoothing. The menu screen is easy to navigate, popping up in the bottom left corner of the screen so that you can see adjustments as they happen. The VPL-VZ1000ES invites you to explore its settings, as the remote has quick-adjustment buttons for Sharpness, Brightness and Contrast, and a 3 x 3 grid of easy-access buttons for other settings. This should make it easier for people to tailor their picture to the environment, but there isn’t the usual one-line, defining sentence in the projector’s menu screens you usually get with other Sony products - and names like ‘MotionFlow Low’, ‘MotionFlow High’, and ‘TrueCinema’ aren’t particularly self-explanatory options. Similarly, the preset picture modes that appear on the top of the remote aren’t immediately understandable. Users might have to take some time to work out whether they prefer the Bright Cinema or Bright TV mode over standard TV, Film 1, or Film 2 - or whether they want to set their own through the customisable ‘User’ option. Set up in Sony’s well-lit offices, we’d be the first to admit that the VPL-VZ1000ES isn't playing in optimum conditions. Nevertheless, we see enough to get a good impression of the projector’s character in some areas. This projector puts its 4K capabilities to good use - we put on Planet Earth II and get an impressive sense of distance between the foreground and background. That’s from the Sony’s attention to detail between the edges of mountains and the blue sky behind them, where less sophisticated products render the scene a little flat. There’s a punchy colour palette there too, as the orange-tinted ibexes look natural against the red rocks of the Arabian Peninsular, but contrast well against the clear waters and surrounding greenery of the stream they drink at. Taking it down to High Definition with a Blu-ray of Guardians of the Galaxy, the VPL-VZ1000ES handles motion quite deftly. Watching Star-Lord slide over tables and Drax demolish a wave of security guards as our heroes scale the Kyln prison ship, each action is delivered with realistic impact while using the MotionFlow Low setting. TrueCinema makes the action a tad too smooth, while turning off the smoothing function completely leaves us with a bit of judder. The VPL-VZ1000ES’ upscaling is effective, and we never feel like we are missing out on detail while watching the Blu-ray. 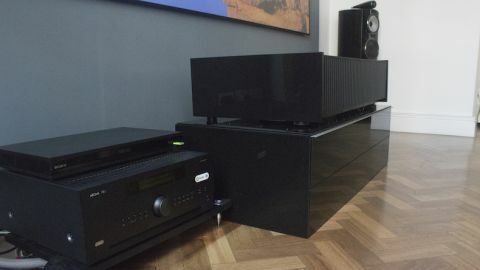 However, the Sony UDP-X800 Blu-ray player the projector is connected to won't accept our test DVDs, so the jury’s still out on just how good the upscaling might be. It also seems a little lacklustre in the blacker areas, not showing up as much detail as we would expect. However, that’s most likely due to the bright surroundings. The projector uses Sony's proprietary SXRD (Silicon X-tal Reflective Display) technology, coupled with a Z-Phosphor laser light engine to produce the high and low contrast points required for HDR video. Theoretically, this means should be able to perform better under more realistic conditions – we reserve judgment on that front until we’ve got it in a darker environment. Those looking for a premium, short-throw projector may have found what they’re looking for in the VPL-VZ1000ES. We’re looking forward to getting it in our testing rooms for a proper look, and finding out exactly how well this projector performs.